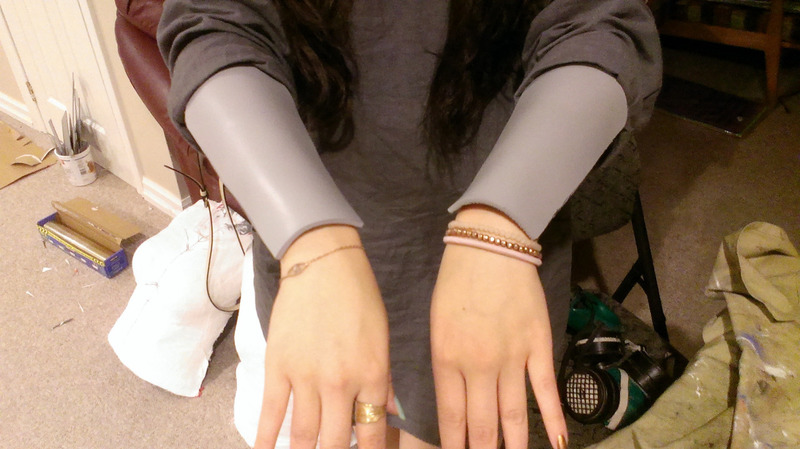 Kat of the Dangerous Ladies (Storenvy, dA, Tumblr) gave this writeup of making the vambraces (forearms) and gauntlets (gloves) for their group’s Fire Emblem Cosplay group. 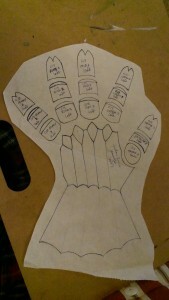 1: Used cling wrap and tape method to mock up the gauntlet sections/details. 2-4: Cut apart tape gauntlet and transferred the pattern onto paper. 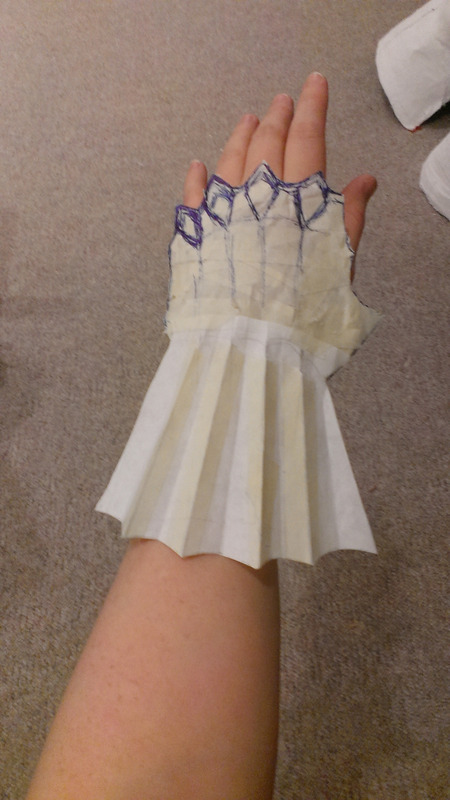 Patterned the flared wrist extension piece by cutting a semi-circle into straight strips and taping them back together, essentially making a paper fan. 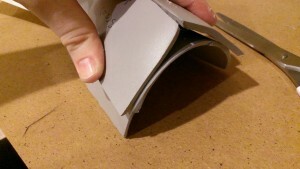 The edges were cut into a webbed shape. 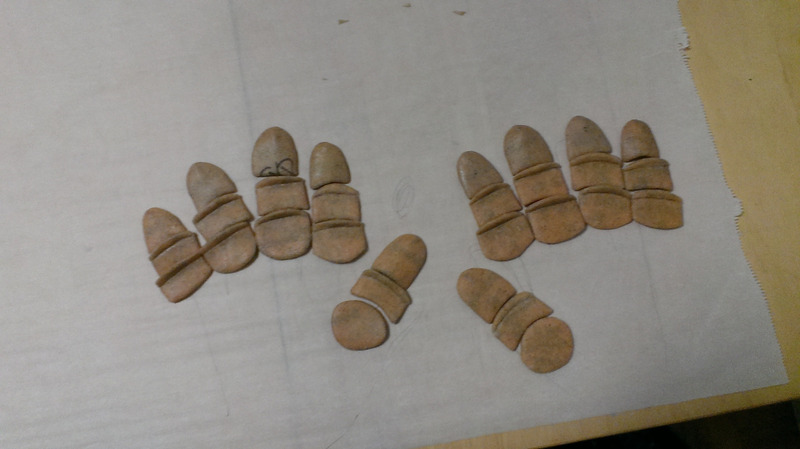 This method of cutting and reattaching the strips was also used in the foam version of the gauntlets; each had strips that needed to be glued into shape before the whole gauntlet base got Worbla’d. 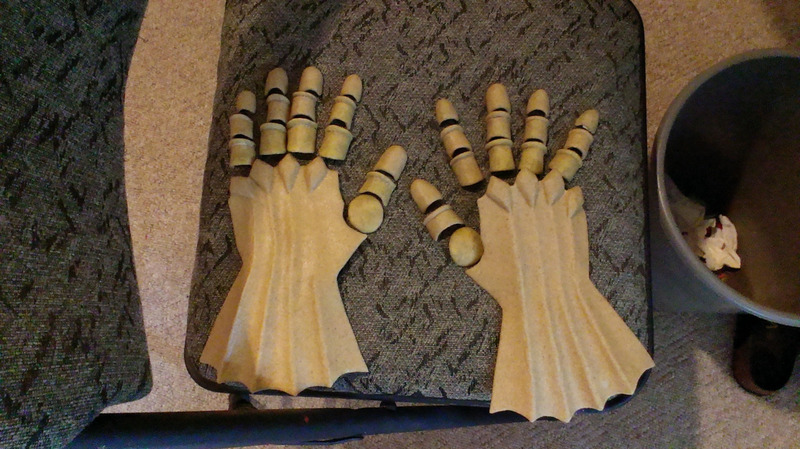 5: I carved the knuckle pieces by hand from Eva foam with scissors and attached them to the foam gauntlet bases so they would show through the Worbla. 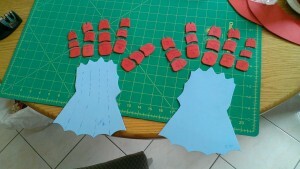 6-8: Finger pieces. You’re looking at 15 pieces of Worbla and 15 pieces of foam per hand. They’re simple to assemble and shape, but time-consuming. Every piece had to be labelled individually and matched with its partner; I used a naming scheme of Finger-Section-Hand, e.g. “Ring 3R” for the third (lowest) section of the ring finger on the right hand. 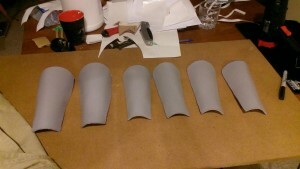 9-10: An assembled set of gauntlets and all six gauntlet bases, which are now in the sealing stage. The little yellow pyramids are painter’s pyramids from Lee Valley, which elevate drying objects so that glue/paint doesn’t pool on your working surface. 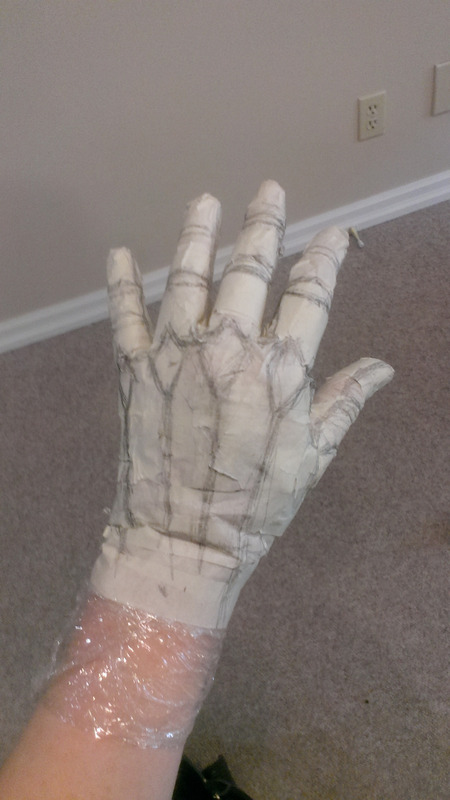 1, 2: Patterned using the cling wrap and tape method, transferred to cardstock. 3: Ran into some snags using Sintra for the first time. 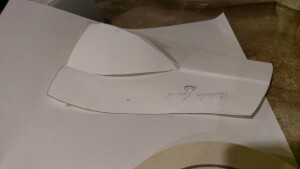 I had seen recommendations to “score” it with a blade and snapping out your pieces. 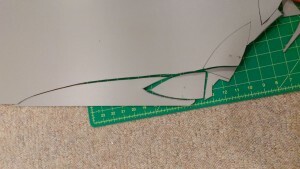 This worked for some of the pieces I cut out, but for others, it caused the brittle material to shatter. This isn’t good when Sintra scraps have limited use! 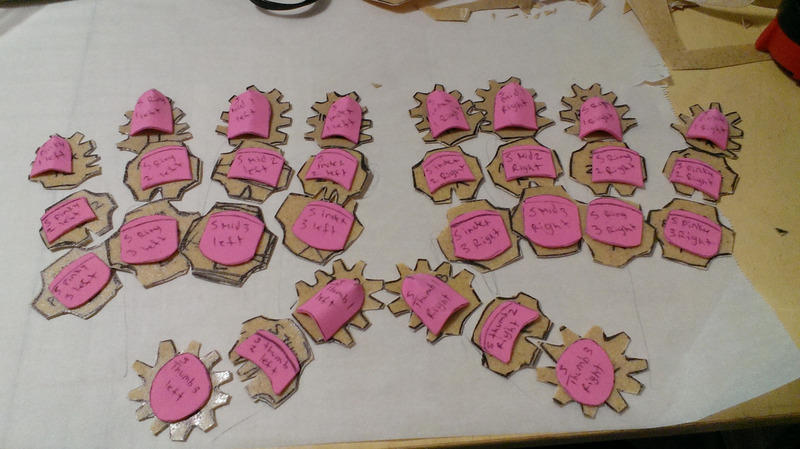 I switched to cutting all Sintra pieces with a band saw and sanding the edges with a belt sander. 4. Another snag was that Sintra doesn’t have any self-adhesive properties, as far as I could tell, and isn’t very malleable. 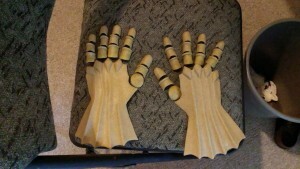 Since the seams can’t just be pressed together like Worbla, assembling raised pieces would require more precise seams than I had time for when I was making these. 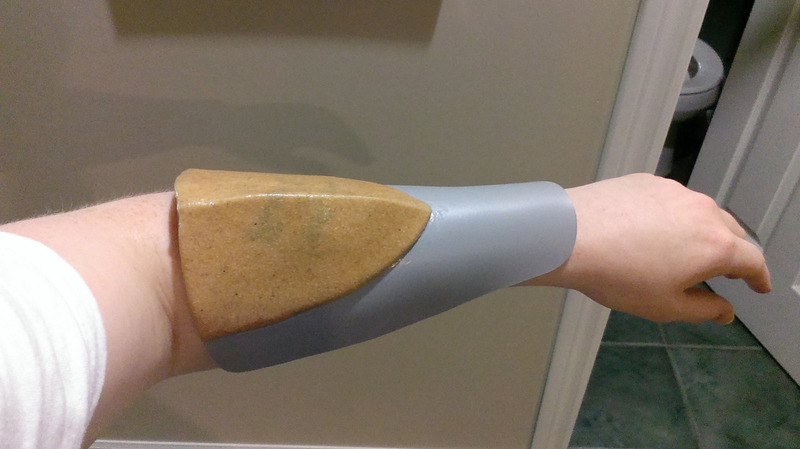 I switched to making Cynthia and Cordelia’s vambrace “shields” out of Worbla. 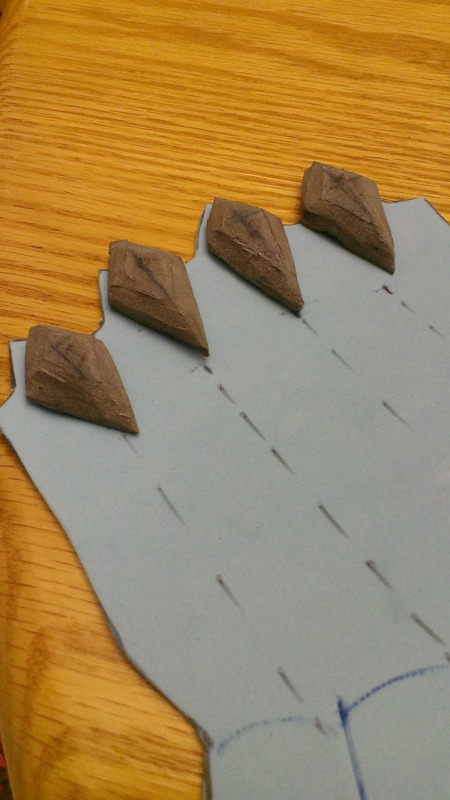 Sumia’s leafy designs lay flat on her vambraces, so I cut them out of Sintra. 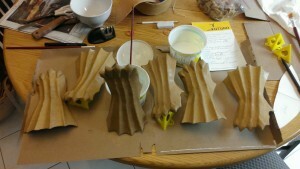 Attaching Worbla to Sintra requires no adhesives; if you heat both and attach one piece to the other, it will stay put! I used contact cement to attach Sintra to Sintra. I wanted to avoid hot glue, as it has a weak bond and could warp the Sintra. 5-7: Our freshly formed vambrace bases. Sintra takes longer to heat up to the point where you can form it, and may not heat very evenly with a heat gun. However, when your only other option is to use an oven (specifically an oven that is only used for crafting and not for food! ), you work with what you’ve got. Be careful when forming hot Sintra over your own/someone else’s limbs; you’ll want them to cover their arms with heat-resistant material. We used an apron draped over a forearm. 8-9: The current state of our vambraces. Sumia’s required no sealant, so they got as far as the base coat stage before our armour project went on break. 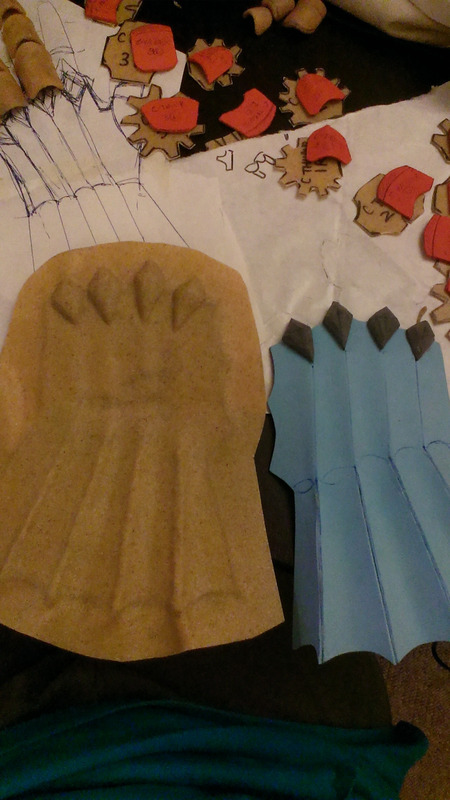 Cynthia’s and Cordelia’s needed their Worbla pieces sealed, and are still in that stage of progress. 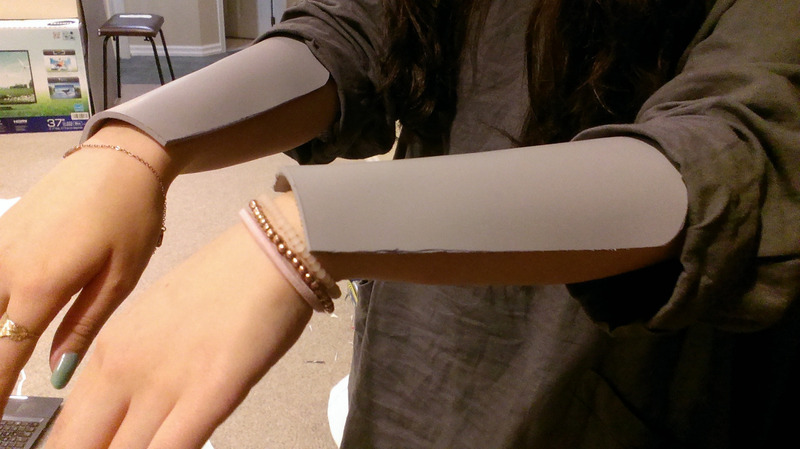 Sumia’s will be finished in the next few weeks, as Emmy will be wearing Sumia at Otakon! 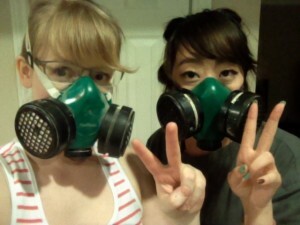 10: Very important reminder: when working with Sintra, wear a respirator and work in a well-ventilated area! Thanks again to Kat of the Dangerous Ladies for sharing this with us! You can find their work here:Storenvy, dA, Tumblr.